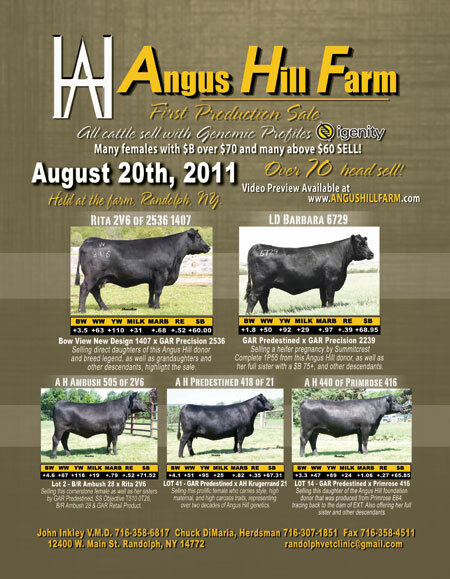 Sale at the farm, featuring females and bulls, many embryo transfer progeny throughout from our top donors. Also including a few our close friends as our guest consignors. Make it to Angus Hill on 8/30/14! (716) 484-7829 -- group code "AHF". hosted by Angus Hill Farm. Thank you to Spruce Mountain Ranch, Larkspur, CO for their purchase of our consignment to this sale. 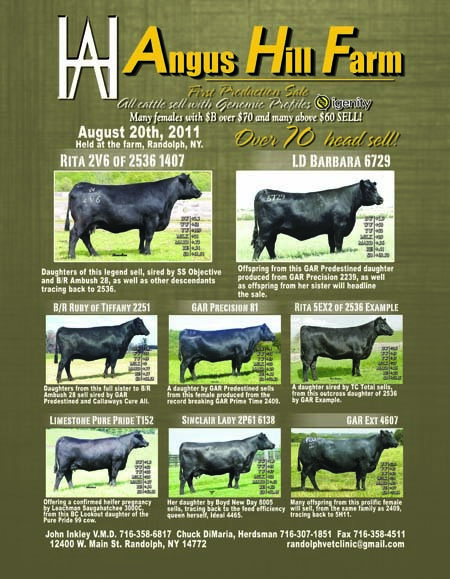 Lot 11, Angus Hill Rita 692 (owned with Hillhouse Angus, TX) from one of our foundation females of the herd "Rita 6108", was the high selling Lot of the day for $28,000. 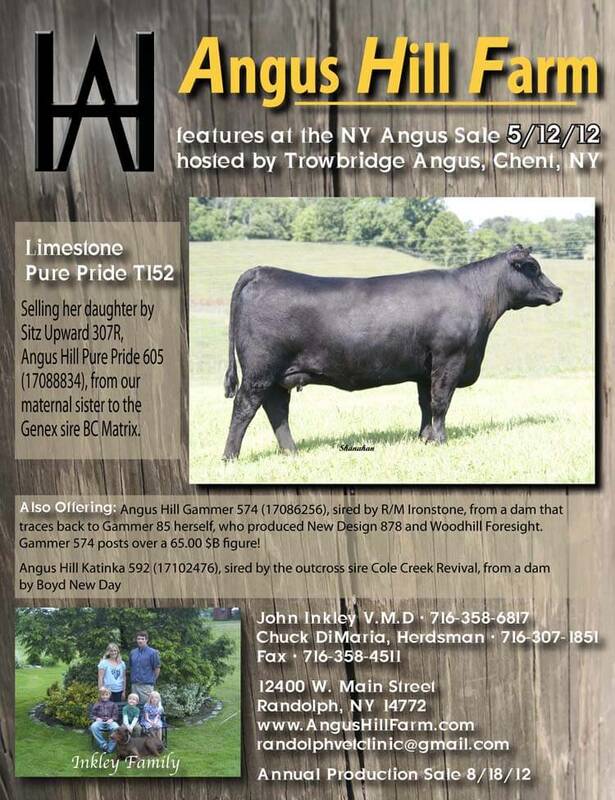 Thanks to 4C Son Farm in PA for their purchase of our Pure Pride daughter and also to Mark Mangano in NY for his purchase of our Gammer heifer. A great sale with great new customers, Thanks again! Jan. 12, 2012, at the National Western Stock Show, Denver, CO. 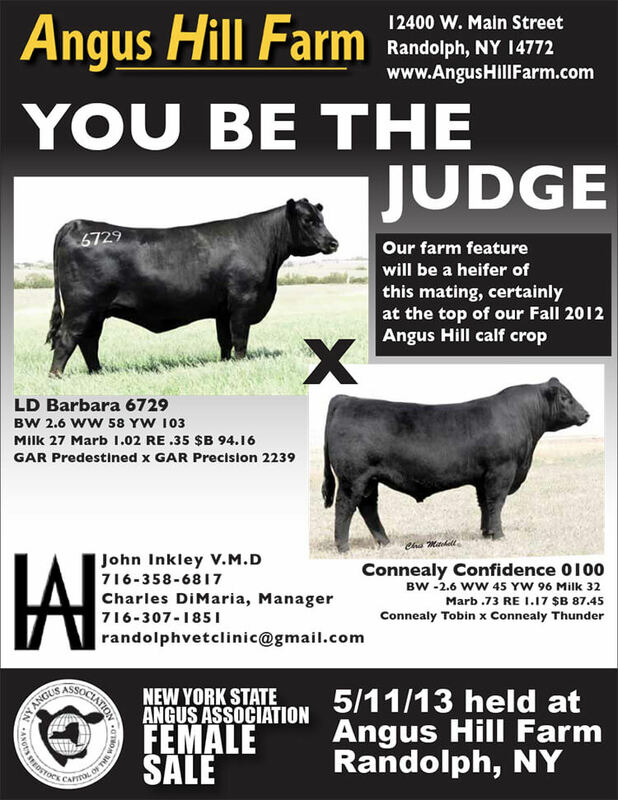 Selling a confirmed heifer calf pregnancy due 8/20/12 Connealy Confidence x LD Barbara 6729. 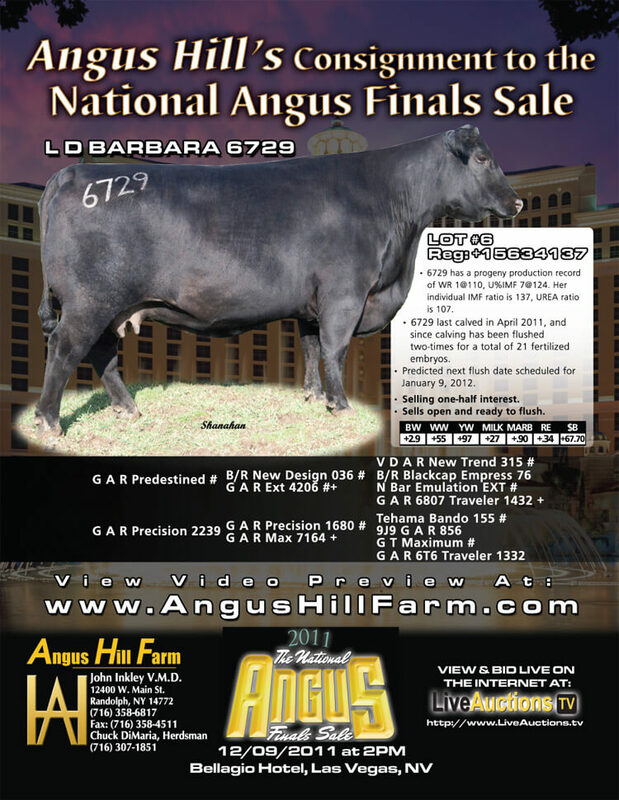 SPECIAL THANKS TO HILL HOUSE ANGUS, LAGRANGE, TX FOR THEIR $5,000 PURCHASE OF OUR PREGNANCY IN DENVER! Video Preview | THANK YOU TO HOBART CARR OF 4C SON FARM, WARREN, PA FOR HIS PURCHASE OF ONE-HALF-INTEREST IN 6729 FOR $13,000.